In 1991, a man named Paul Glover introduced what would become the most successful Community Currency to date: Ithaca Hours, which are based on one hour of human labor. A single Hour is valued at $10 USD, and participating members can use them to pledge their own labor as security for purchases at many local merchants. The result has been to revitalize Ithaca, NY, by keeping more of the money in the area from being spent at large chain companies that carry it away from the community. 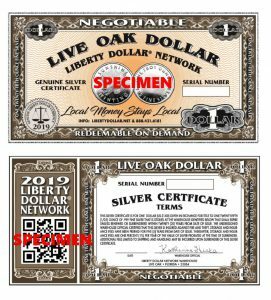 The Liberty Dollar Network is out to bring similar benefits to many communities, by branding Liberty Dollars for the communities that use them. 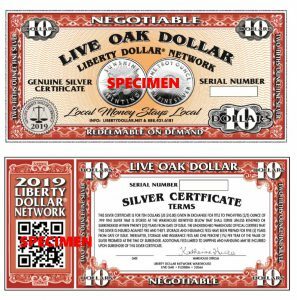 We've already gotten a start on it here in Live Oak, Florida, where our Main Office is located, and these are the final designs for the 2019 Live Oak Liberty Dollars. Make it possible for everyone to gain from having Liberty Dollars in their community. 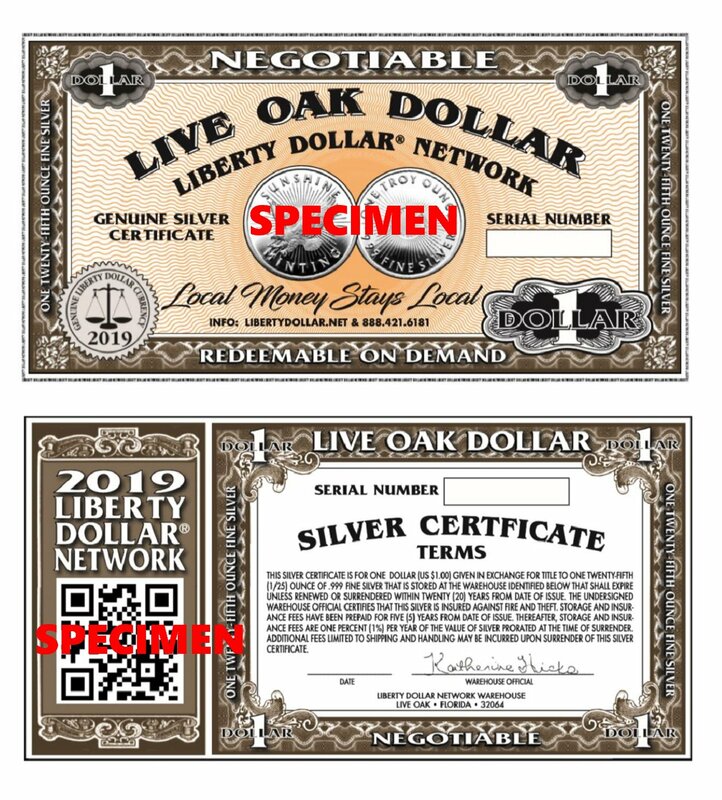 Liberty Dollars are backed by .999 fine Silver at a base value of $25 per ounce, which means that every ounce of Silver our Members buy from us gives them $25 in spending power with Liberty Merchants and Network Members who offer goods and services through the LDN Classified ads system. These ads are similar to Craigslist, and allow Members to buy, sell and contract with one another and use Liberty Dollars or eLD as payment. This system gives even those who don't have money to buy silver a chance to get some of it for themselves. 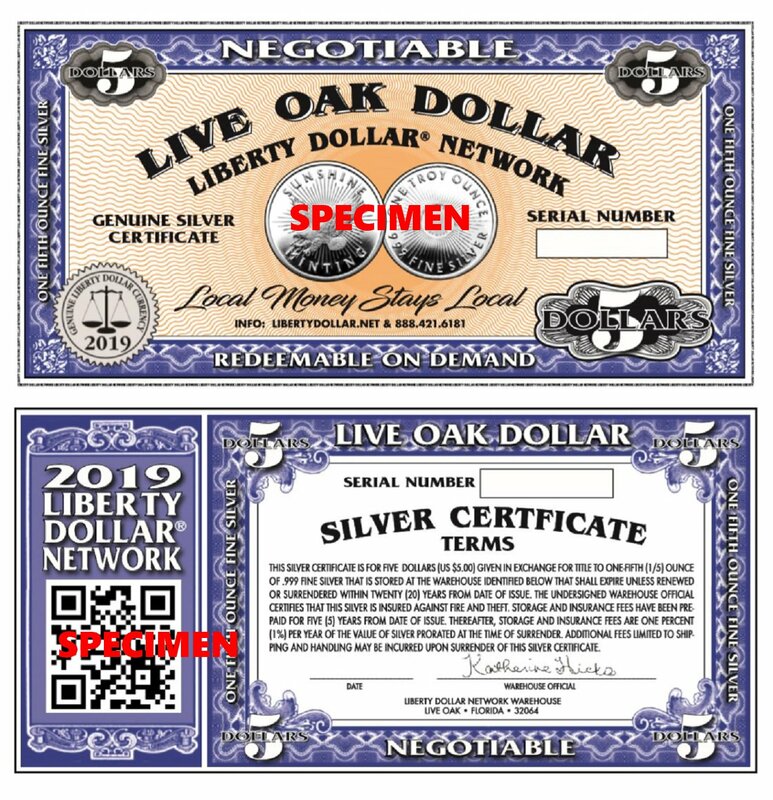 Liberty Dollars they earn from work or selling their own items are still backed by silver, and can be redeemed by the bearer at any time. 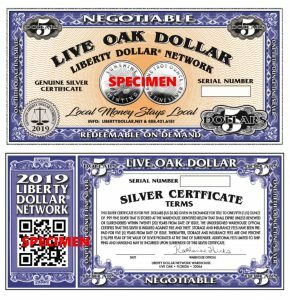 This is a legal form of private money that anyone can accept and use, and Community Currency Coordinators will help everyone understand how to use it and why it's good for the community. As Bernard von NotHaus says, "Local Money Stays Local." 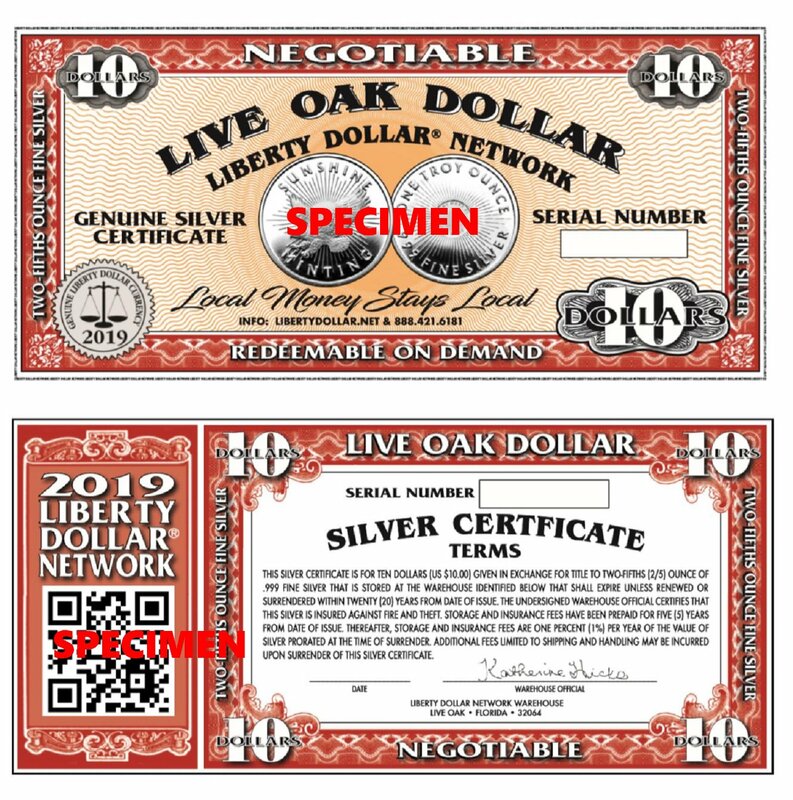 We like to add, "So let's keep the local money local, with Community-branded Liberty Dollars!" If you're interested in bringing the benefits of Liberty Dollars to your community, please consider becoming a CCC. It's a profitable business that will help your community as it makes money, and helps your friends and neighbors live better.